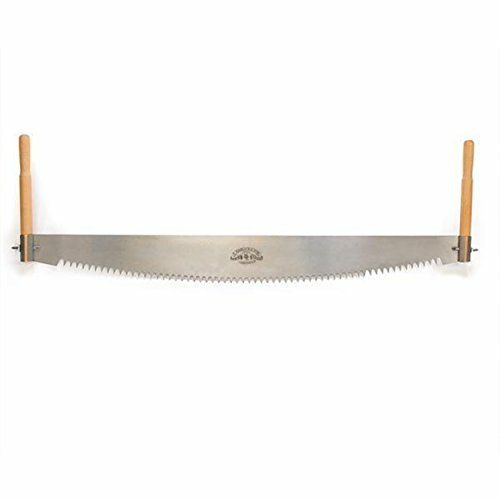 These large saws have been used mostly in forestry work and for crosscutting large logs, but in recent years they have become popular with people aiming to cut their own firewood in a more traditional fashion. Each saw is made from British CS80 steel with a Rockwell hardness of 44-46 and a thickness of 1.5mm to provide a superior stiffness when cutting on long strokes. This blade's tooth pattern is a Peg tooth formation at 1 TPI, hand set, and cut with the pull/push stroke in each direction. The two handles are solid Beech, and the teeth can be re-sharpened with a large triangular file. Peg Tooth 1 TPI pattern for use on logs, etc.